Rebooted 7/5/2013 after a 1513-day (4 year) uptime! sam.julianhaight.com is named for the brave Sam Gamgee, Frodo Baggins' tireless servant from J.R.R. Tolkien's trilogy The Lord of the Rings. It follows a long tradition of Unix machines named after mythological figures from Tolkien and other classics. Sam is hosted by Accretive Technology in a Switch and Data facility in Seattle's internet nexus, the Westin office building. Familiar development environment - I know where everything is, and I can get new projects rolling faster. I don't have to worry about different system configurations or lacking system software. Performance - A good software design, not fast hardware, is the important thing. Too many web sites have bad design and try to compensate with fancy hardware. The foundation of this configuration is Linux and the Apache web server (This configuration has recently garnered the buzzword LAMP - Linux Apache MySQL PHP/Perl). Good design means many things - correctly processed images, few redirects, fast CGI processing (in this case a pre-loaded Perl interpreter), an efficient database design (and engine). Security - Security is not black and white. There are different levels for different tasks, and there are many complicated issues involved, but control over the system software is an important pre-requisite. Frequently, new security holes are found in system software. Linux and Apache tend to have fewer, less serious, and shorter periods of vulnerability than many other options. Keeping up to date on the latest stable software is an area that is too-frequently neglected, but Linux is one of the safer systems when it is neglected. Added functionality - Different sites have different requirements: encryption, automatic email processing, password-protection and dynamic content to name a few. Providing the correct solution often involves integrating new software. Sometimes enhanced server software provides capabilities not found on normal commercial servers, usually it just makes life easier. Why such a slow processor? "This kind of optimization has been slowed down by the limits in network bandwidth. At present, you saturate ten-megabit networks so easily that there's no reason to optimize more. Intel would like you to think that a fast processor is as important now as it was in 1985, but the truth is that for most applications, the CPU is hardly utilized. As the load average above will no doubt confirm, this machine is no different. A load of 1.00 is full utilization of one CPU. The machine can still run smoothly up to a load of 3x the number of CPU cores and run acceptably well beyond that depending on your personal frustration level. Realistically, a web server only has to be as fast as it's connection to the internet. The Internet is a fairly slow medium compared with the age-old 10baseT standard (approximately 2 megabits). 286s were acting as file servers for 10baseT networks long before the Internet was popular and although serving web pages is a harder job than serving files, a pentium is still more than adequate. Why Unix as opposed to Windows? It's more appropriate for this application. Microsoft's was never designed to be an internet server. They shoe-horn gee-whiz features on an unstable foundation - they put the cart before the horse. Why ubuntu? ...as opposed to some other Linux package (Slackware, SUSE) or some other Unix implementation (BSD, Solaris, SCO). This one is a little harder to explain rationally. It's mainly because I'm used to it. There are few real differences between these different flavors of unix. For most functions, it just comes down to an issue of style. Any Unix implementation can run most if not all the software that this system runs. There are some differences in the kernel's speed, but they are so slight that it's hard to say for sure which is faster for any particular application. Linux's hardware support has outpaced the other *nix flavours in recent years. 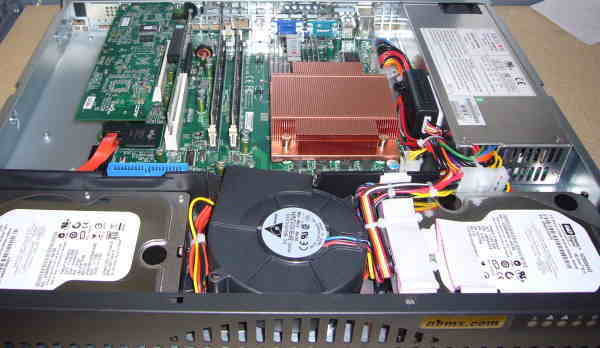 I am able to get information about my server like CPU temperature. I can boot from the latest 3ware SATA raid controller. These type of things might be more difficult with freebsd or another unix. I have used other linux distributions over the years, originally using the venerable slackware. Why Apache? "It's really the only choice." -- no longer. I'm now partial to nginx. I'll switch sam over someday. (C) Julian Haight, All rights reserved.